Substituting a Coat of Arms for a Logo? Of course, it’s nearly impossible to visit Florence and not see the Uffizi Gallery, and we didn’t want to miss it in any case. The Uffizi has a very nice gallery in the courtyard formed by the two long and one short wings of the building containing alcoves with statues of famous Florentines. 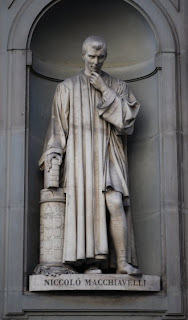 One of my favorites among these statues was the one of diplomat, humanist and author Niccolò Macchiavelli, who wrote The Prince, a practical treatise on acquiring and keeping political power dedicated to Lorenzo di Piero de’ Medici. This is not his only book (one of which was a eight-volume history of Florence), but it is certainly his most famous one. 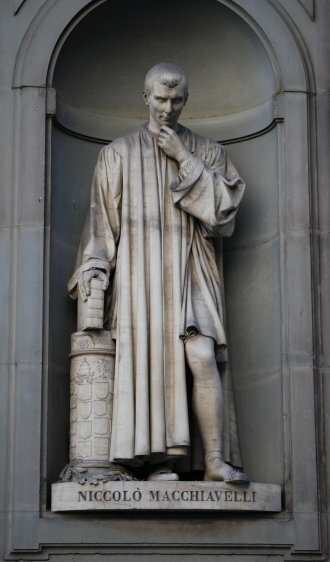 What in particular attracted me to this statue was the short column upon which Machiavelli is resting the book which he holds in his hand: it’s covered with coats of arms in addition to the symbols of the papacy (the papal tiara and crossed keys) and of Rome (a she-wolf suckling Romulus and Remus). What a great display of heraldry! I wonder what it would cost to get a similar bookstand made for my library?